My approach to painting derives from a great appreciation for the sensuous nature of the medium and an understanding of the communicative possibilities inherent in its many manifestations. As a representational painter, it is not my intention to produce an exact mimesis of my subject, but rather to manifest an underlying content that resonates with my audience. I consider my work to be spaces of crisis. Through the use of a wide range of technical and formal approaches, along with a variety of subject matter, my work evokes the tension created by the realization of unmet expectations and the limitations of personal potential. Discourse of the Chase questions the limitations of human compassion in the face of conflicting subjectivity. The paintings from Discourse of the Chase, depict narratives of foxhunting, a centuries-old sport riddled with intrinsic conflicts. The central question of this work inquires about the reasons for our persistent need to chase that which we know has no apparent utility. What does this say about our capacity for empathy despite the apparent futility of such pursuits? In this series, I cast the foxhunt as a central character in a series of allegorical paintings portraying the ambivalent, and at times contentious, relationship between humans and animals. The complicated interdependence and alliances of the hunter and the hunted also operate as metaphor for the relationship I have with my brother, himself the Master of the Foxhounds and Huntsman for the oldest continually operating hunt in the United States—The Rose Tree Hunt (now Rose Tree-Blue Mountain Hunt). In much the same way that the hunters simultaneously admire the fox as both a worthy opponent, able to elude the hunt, and as vermin, an annoyance to rid the countryside of, I find myself in conflict with my own pursuit of my brother’s affection. The narratives of this work examine the purported value of the various types of interactions that occur in this false pursuit (most foxhunting in the United States is not intended to kill the fox)1. These works are a distillation of fact and fiction, intended to heighten the underlying con­struction of the hunt and the false sense of anticipation in the outcomes they espouse. 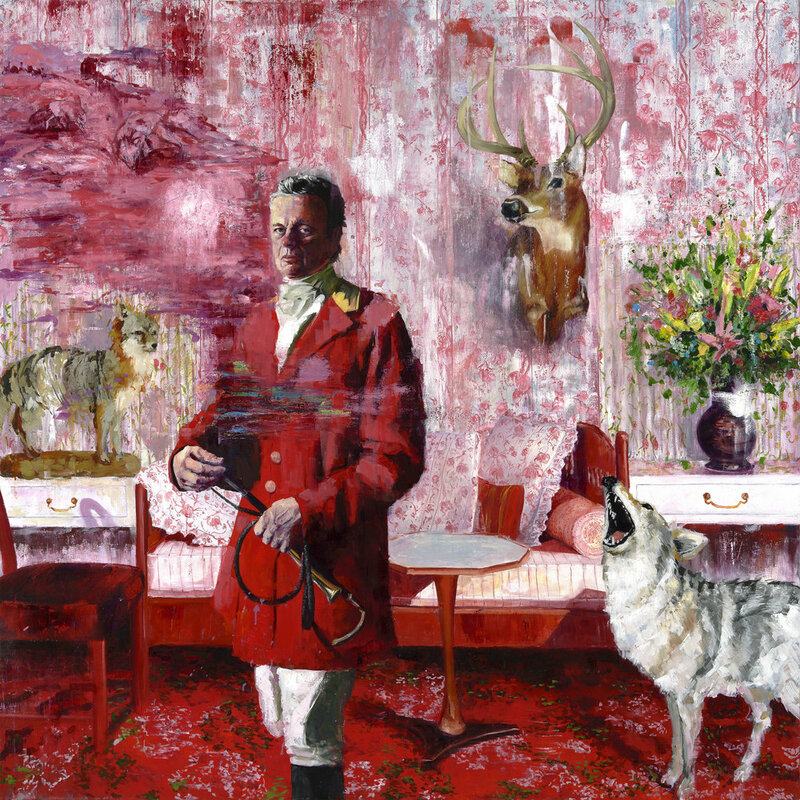 The paintings evince this layering of fact and fiction both materially and metaphorically by way of their manufactured spaces, subjects and events mimicking the fabricated narratives that the hunters invent to generate excitement and enthusiasm among themselves as a means of justifying their actions. The foxhunt func­tions as a metaphor for the perverse complexity of relationships and personal chimeras we experience.